Embarked on a quest to find the BEST SINGAPORE player against the TOP JAPAN and KOREA representatives in K.O EPISODE 1 FINALS which is going to be held at TGX 09! The CHAMPION will REPRESENT SINGAPORE on July 4 against the best from Japan and Korea. He/she will also receive automatic qualification to the K.O EPISODE 1 FINALS. While the 1st and 2nd Runner up will win Limited edition SF4 premiums + priority seeding for K.O EPISODE 1's qualifiers. CHAN WEI JIE (Dhalsim) - 2nd Runner Up! Jia Chun aka Pek Hun won the right to represent Singapore in July's Represent 3-nations Street Fighter IV exhibition match against the Korean and Japanese. He has also booked himself a place in the Street Fighter IV K.O EPISODE 1 Finals! Lastly, the Organising Committee (Round1 & Virtualand) would like to say a BIG thank you to all the participants and spectators for the support of the event! 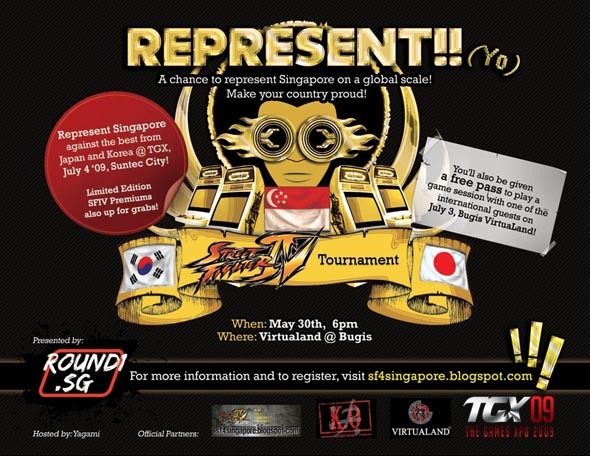 Visit Round1.sg or SF4Singapore.blogspot for details.